Image caption Family members told CNN Megrahi is "comatose"
Lockerbie bomber Abdelbaset Ali al-Megrahi is in a coma at his Tripoli home in Libya, it is being reported. 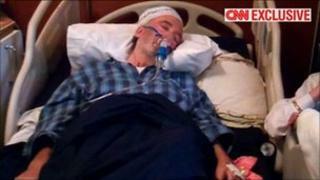 CNN said Megrahi appeared to be "at death's door" in the care of family. He is technically on licence but his whereabouts were thought to be unknown. Megrahi was freed from a Scottish prison in 2009 on health grounds. There have been calls for him to be returned to jail in the UK or tried in the US. But Libyan rebel leaders have said they do not intend to allow his extradition. Megrahi had been jailed in 2001 for the bombing of a US plane over Lockerbie, with the loss of 270 lives, before he was diagnosed with terminal prostate cancer and freed. Scottish officials had tried to contact him following the rebel advance into Tripoli. Megrahi technically remains a Scottish prisoner released on licence and is obliged to remain in regular contact with East Renfrewshire Council. On Friday, the Scottish government said he had not been due to contact them for some time yet but social workers from East Renfrewshire Council had been trying to contact him. After reports that Megrahi had been found, the government and council issued a statement saying they had been in contact with his family and his licence had not been breached. International Development Secretary Andrew Mitchell said the fighting and disorder in Tripoli had made it harder to keep track of him. "His life does appear to be drawing to a close, he's in a coma," he said. CNN reported on Sunday that Megrahi was "comatose" and "near death... surviving on oxygen and an intravenous drip" and not eating. "We just give him oxygen, nobody gives us any advice," Megrahi's son, Khaled, told the US broadcaster. "There is no doctor. There is nobody to ask. We don't have any phone line to call anybody." CNN reporter Nic Robertson said he last saw Megrahi two years ago and described his appearance as "much iller, much sicker, his face is sunken... just a shell of the man he was". Megrahi is the only person to have been convicted in connection with the bombing of Pan Am flight 103 over Scotland in 1988. The victims of the bombing were mainly US nationals and the decision to release him, taken by Scottish Justice Secretary Kenny MacAskill, sparked an angry reaction in the United States. The former US ambassador to the United Nations John Bolton told BBC Radio 5 live that Megrahi should have been given the death penalty and was lucky to be alive. Mr Bolton said Megrahi should be in jail and called for him to extradited. "To me it will be a signal of how serious the rebel government is for good relations with the United States and the West if they hand over Megrahi for trial," he said. "He killed 270 people. He served roughly 10 years in jail before he was released by British authorities. Do the math - that means he served roughly two weeks in prison for every person he killed. Two weeks per murder. That is not nearly enough." Stephanie Bernstein, whose husband Michael was one of those killed, told BBC Radio 5 live that Megrahi's death would bring some regret to the victims' families. "He was one person in a long line of people who I'm sure was responsible for the bombing and when he dies, some of the knowledge about what happened will go with him," she said. She added that she hoped the rebels' National Transitional Council would be committed to finding out what happened. Bob Monetti, the father of another victim, said Megrahi was a source of embarrassment to Scotland but "sort of irrelevant". "Mr Megrahi just probably put the bomb on the plane, but somebody else made it, and somebody else told him to do it, somebody else planned the whole thing out," he told the BBC. "I'd like to find out who those people were, and find out a lot more of the details about what went on and why they did it." But Dr Jim Swire, whose daughter Flora was killed in the blast, said he believed Megrahi was innocent and hoped he was getting decent pain relief at home with his family. "I feel extremely resentful that the murder of my lovely elder daughter Flora should be embedded in what I'm satisfied is in fact a tissue of lies which led to a politically useful outcome," he said. Mohammed al-Alagi, justice minister for the new leadership in Tripoli, earlier refused to countenance handing Megrahi over. "We will not hand over any Libyan citizen to the West," he said. "And from points A, B and C of justice, Abdelbaset al-Megrahi has already been judged once, and will not be judged again. "We will not hand over any Libyan nationals, it's Gaddafi who hands over Libyan nationals." The National Transitional Council is now recognised by Britain as the sole governmental authority for Libya.